The Mercury Program went from 1958-1963 and was made up of 20 unmanned and 6 manned missions. It was the U.S. first space program that launched humans into orbit. It had three goals: (1) place a manned spacecraft into orbit, (2) investigate man's reaction to space flight and (3) recover the pilot and spacecraft successfully when they returned to Earth. Navy ships were positioned near the capsule landing point. They then sent out helicopters to retrieve the astronauts and capsules. 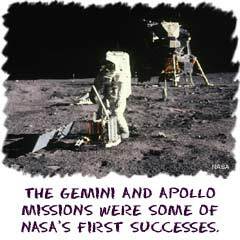 The Gemini program was the second step for NASA. Its goals were a more ambitious. (1) Put two pilots and equipment in space for up to two weeks. (2) Rendezvous and dock with another orbiting vehicle and maneuver both spacecraft with the propulsion system. (3) Refine and perfect procedures for reentry (return to the surface) to a specific and preselected landing point on land. They were not able to accomplish the last goal. They were only able to have water landings.